The folklore goes like, to celebrate the win of the battle of Plassey, first Durgapuja was celebrated by few babus in Nadia and Kolkata village. But the Durga puja used to be celebrated in the traditional families and commoners were not allowed to enter. But few men thought otherwise. And Baroari Puja was borne. Today the form of puja we experience is called Baroari Puja. Around late 17th century, fed up of family-owned puja, in a place called Guptipara in Hoogly, 12 friends pulled up their resources and started the first public puja. It was jagaddhatri puja and made way to public run Durga puja even. From 12 friends or 12 yaars, it was baaro-yaari puja and hence came the word baroari puja. And if 12 or more friends come together, can food be left far behind? No, not. Durga Puja is treated as a homecoming of the daughter. And it is treated differently for East Bengal and west Bengal. 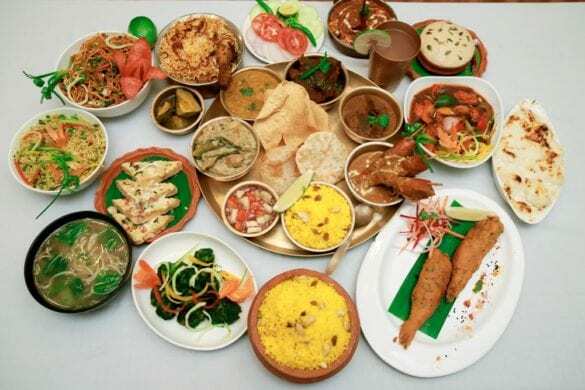 In East Bengal, matsyamukh (with fish) was favored, wherein in West Bengal, the Vaishnava vegetarian affair is more popular. eve, it is said that in East Bengal, offering a hilsa was mandatory. But surprisingly, the Vaishnava culture was predominant in West Bengal and this ensured a dominance of vegetarian fare. But in the Shakta culture, the offering of meat was perfectly alright. And hence, in few households, meat is offered as bhog to Goddess Durga. 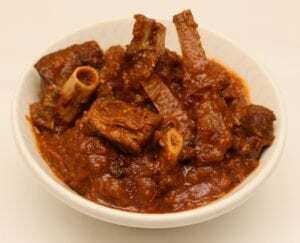 For puja special menu, a niramish mangsho (mutton cooked without onion and garlic) is done and offered to god. The story goes like, Bali is taken from the tantrik school of thought. It’s done during sandhi puja when Ashtami ends and Nabami starts. When durga is worshipped at chamunda, who killed chanda and Munda. Here mutton is cooked without onion and garlic and the item is named as Niramish Mangso in served in the puja special menu. Another story goes like, in earlier days, the non-brahmins were not allowed to offer cooked rice to the goddess in their durga puja food. And hence, they offered uncooked rice with fruits and sweets. And an assortment of fruits and sweets (goja khaja etc) compensate rice or khichuri. Dasami is taken as the last day of goddess Durga before she leaves for her home in mount Kailash. And obviously, she doesn’t have the time to cook. 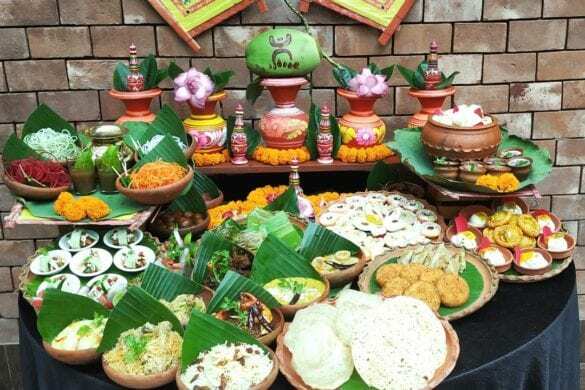 Now, for the shortage of time to prepare a lavish Durga puja food, cold food a.k.a Panta Bhat is served to the goddess and the day, thus, is called as Shitol Bhog. 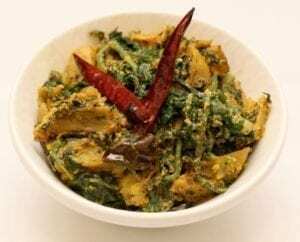 Another folklore goes that, in durga puja food, offering bari (mounted lentil dumpling) and achaar is strongly encouraged. The reason again being, the goddess is taken as the daughter of the house. And the household offers the unique homemade delicacies to her. Even it is said that spoiled milk should not be offered to any god or goddess. 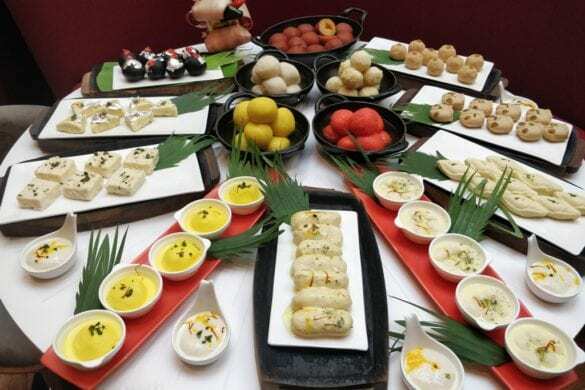 and as a result, traditionally, no chhena (cottage cheese) sweets, like Sandesh or rasogolla, were used in the bhog during the Durga Puja food bhog. Mostly, the sugar made monda, Kodma, Batasa, Payesh etc ruled the bhog. So, here are the few stories that I could gather from different sources and one of the primary articles that I’ve referred can be checked here. So, what are the hotel offerings? 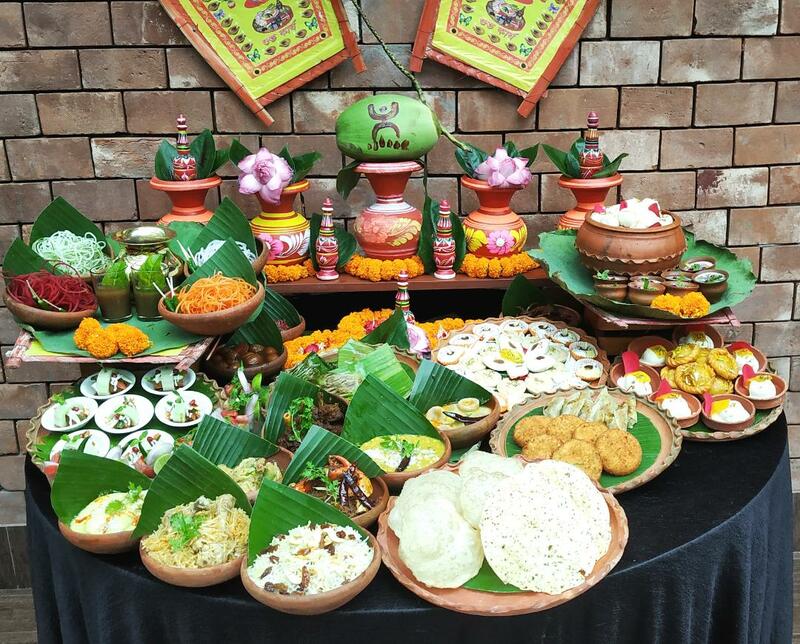 And naturally, the city hotels have decked up for the biggest festival in Kolkata with the best of their offerings. 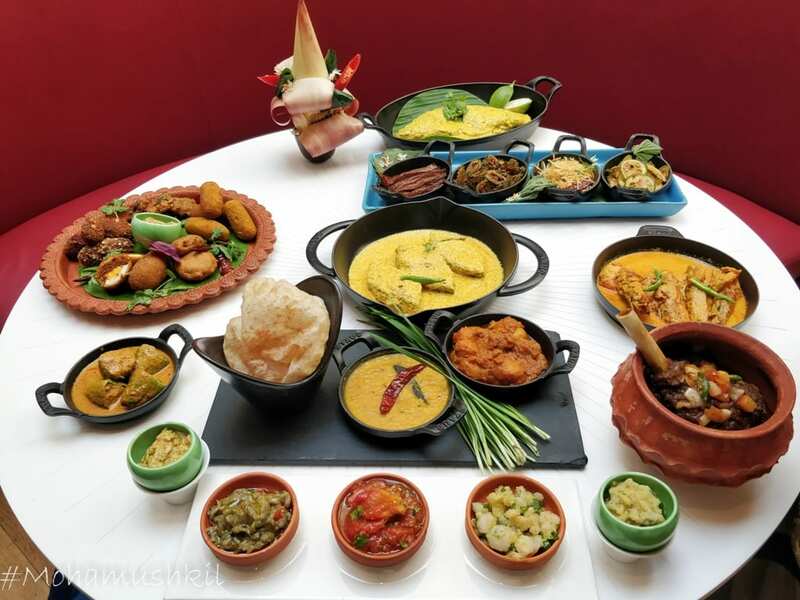 Regarding food, let me be honest, apart from my home food and a few pice hotels, I rarely taste Bengali food outside and I am slightly biased towards that. surprisingly, my family is not like that and for them, I’ll have to re-visit a few of these places for the Puja Special Menu again. But these places, have made some seriously good stuff and I can personally vouch for few of them. So, here, is a compilation of the offerings. 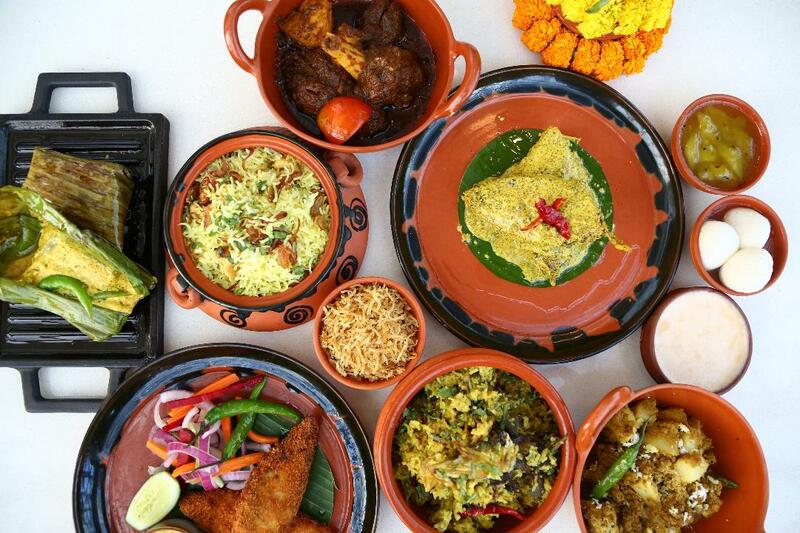 Oberoi Grand Gharana 16-19 October 2018 Lunch and dinner buffet: 16, 17 & 18 Oct 2018 | Lunch buffet only: 19 October 2018 II Lunch: 12.30 pm to 3 pm | Dinner: 7 pm to 11.30 pm Grand Pujor Mahabhoj- Rs. 2250+ taxes per person Apart from the traditional favourites i.e., Kosha mangsho, macher paturi, Chital macher muittha, Chingri malai curry and more, this year the menus will include gems like kucho chingri diye kalmi saager boda, kathal pata diye boda, aam ar macher jhol, aam ada diye bhaja mooger dal and similar special dishes. 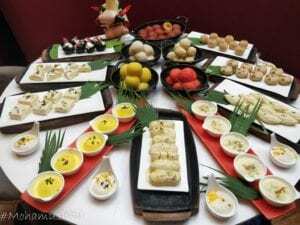 This year, apart from the usual Durga puja food festival, Hyatt Regency Kolkata has come up with an innovative concept. 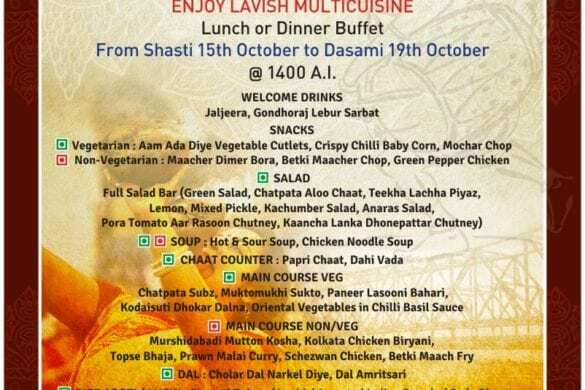 they’ve arranged for a sit-down vegetarian spread on Ashtami and is very reasonably priced at 1499+ Tax. Live performances are also there in the package. Do check the menu here. 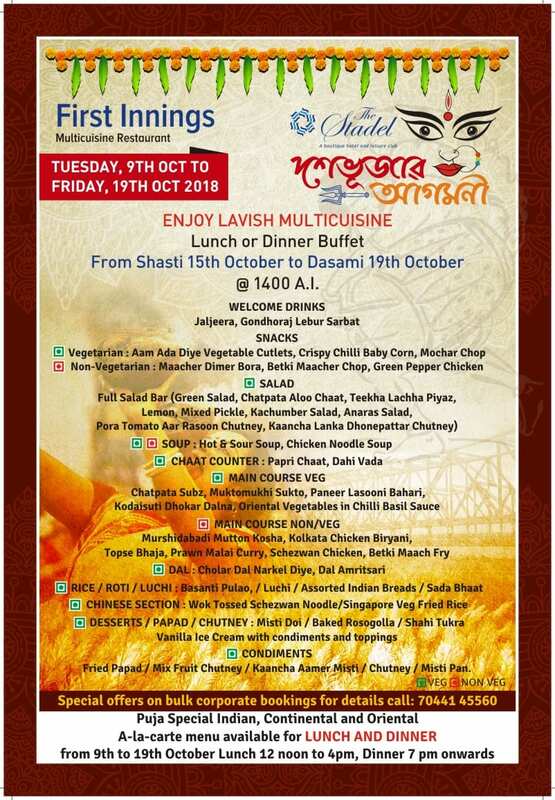 The same can be booked here #LetsBhoj ..
You can check the offering for Novotel Durga Pujo Food Festival here. 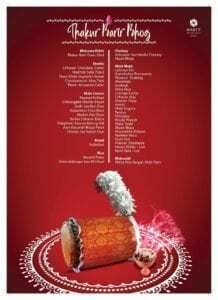 Taj Bengal Kolkata and Gateway Kasba, both have also geared up for their puja offerings and it can be checked here. 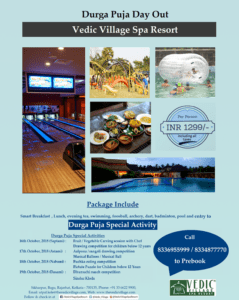 Press Release- Puja festivities @ The Taj Bengal & TheGateway Hotel EM Bypass. So, wish everyone a very happy Durgapuja and may goddess Durga bless you and your family. 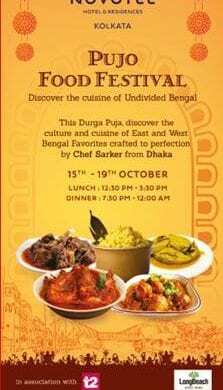 Enjoy Durga Puja food to your heart’s content and Bon Appetit !! !